Home » Blog » Pregnancy » Why Fiber is Important During Pregnancy? 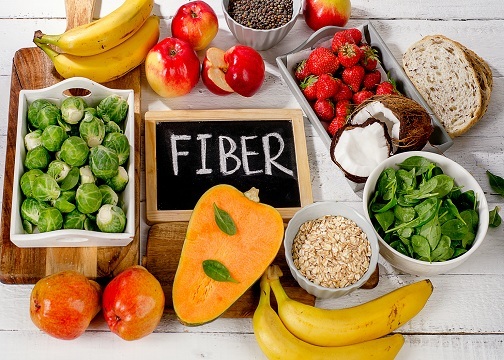 Why Fiber is Important During Pregnancy? Fiber is known to provide bulk to your food and keeps you full for a longer period of time. Fibre rich foods are recommended to pregnant mothers for various reasons. Let us find out how crucial its role is in a to-be mother’s diet. Fiber rich food can help you deal with constipation. You can be constipated due to many reasons, mainly due to hormonal changes occuring in body. Consuming fibre rich food can relieve your constipation by adding bulk to your feces. It is also observed that mothers who consume fibre rich food have maintained blood pressure levels. Elevated blood pressure is common during pregnancy but it can cause problems during delivery. Consuming a bowl of salad and fruits rich in fibre can significantly lower the increased pressure. Hypertension is also a major concern during pregnancy. Fibre rich foods have an impact on that as well. If you have problems related to hypertension in general, consuming fibre rich food can be beneficial for you. Preeclampsia is another problem seen during delivery. Studies show that women who consumed fibre rich food during pregnancy, reduced the chances of complications that occur due to blood pressure levels significantly. Soluble fibre– These fibres are stored in body for a longer period of time and also helps in absorption of sugar. Soluble fibre containing food are oats, lentils, apples, nuts and seeds, strawberries etc. Insoluble fibre– These type of fibres do not get stored in the body and makes bulk of the stool. They also play important role in maintaining pH balance of intestines. Food which contains insoluble fibre are brown rice, carrots,wheat bran, whole wheat bread etc. If you still can’t get enough of fibre, ask your doctor to prescribe some fibre supplements. This will show effects a little early but however, should not become the only source for your fibre. You can also increase your fibre intake by consuming salads, sandwiches and whole wheat bread more often. Try breaking down your meal into 5-6 portions for easy digestion and replace all the unhealthy snacks with fruits like apple, to meet your fibre intake goal.